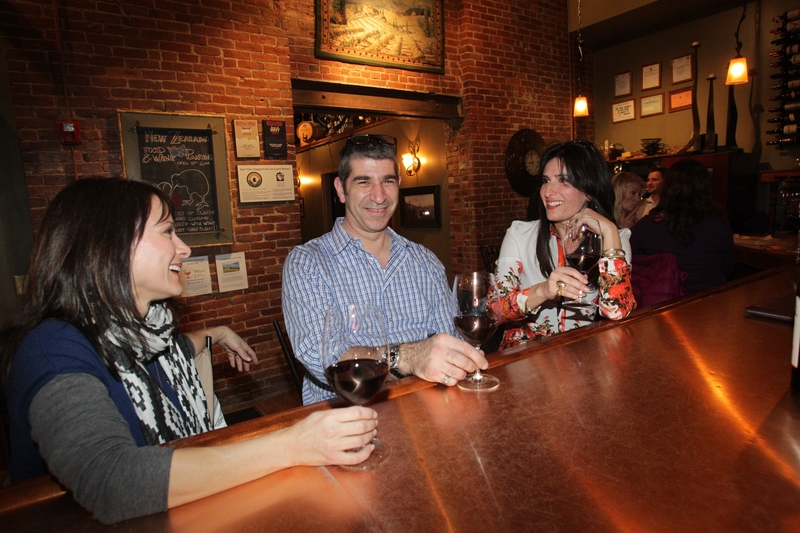 Rhea Anna of Buffalo, Doug Levere of Amherst and Leah Glickman of Buffalo enjoy glasses of wine at Just Vino. For those who enjoy wine but don’t know much about the wine-making process or how to tell a pinot from a port, it can be intimidating to visit an establishment that specializes in the fruity nectar. Rest assured, wine is no longer solely for the rich and privileged, and those who love it are increasingly willing to share their knowledge with the masses. Such a place to find this passion is Just Vino. Open from 3 p.m. to midnight daily, a small happy hour sign welcomes those working and playing along a thoroughfare that soon will be bustling with the expansion of the Buffalo Niagara Medical Campus. A winding bar with a large array of wines welcomes those who enter. Beyond the bar is a cozy dining area with a 5-foot white replica of the Eiffel Tower, glittering with lights. Full wine racks acted as décor and large picture windows facing Main Street served as advertisement, as passers-by slowed down upon witnessing a dozen people inside relaxing with a glass in hand. For the novice, flipping through the menu can be a bit overwhelming, but the staff was ready to assist. Two servers cheerfully offered samples and lessons to those unsure of the sweetness or dryness of each of the dozens of whites and reds on the extensive menu, while answering questions about food pairings. With wines spanning the globe from New York to California to Italy and beyond and 20 to 30 different wines available every month, those who remained uncertain about what they preferred opted for tastings or “flights” (four 2-ounce tastings) to help narrow down the choices. The appetizers also thrilled the taste buds. Brie was featured in the Adult Pop Tart, a baguette topped with the cheese as well as strawberry and a honey drizzle. A variety of cheeses and seafood hors d’oeuvres allowed for a filling and heavenly experience without breaking Lenten sacrifices – perfect for a place that is within eyeshot of the Catholic Center. Sports attire? Dress jeans? Business casual? Black tie? Everyone is welcome. From young professionals to the older gents reliving their college days by attending the NCAA tournament, Just Vino draws in visitors to relax and savor the tasting experience. Friends shared their wine preferences, co-workers discussed their day and a Buffalo native visiting from his home in Australia talked about redevelopment around his boyhood neighborhood with his English wife. Oldies music (pre-1980s) whispered in the background, allowing emerging wine connoisseurs to compare notes without having to yell across a table. No matter the age or experience level, patrons took the time to swirl, sniff and sip. Nobody guzzled. Nobody got rowdy. Nobody appeared to be drinking to get drunk. Refreshing. If you arrive with little knowledge, Just Vino won’t judge. Sample, learn a little and then enjoy what you like. Just Vino offers sophistication without pretension. Where: 846 Main St. (725-0166). When to go: 3 p.m. to midnight daily. Visit as a sole destination, a happy hour outing or part of a downtown excursion. Dress: Come as you are, whether it’s after a sporting event at the First Niagara Center, an evening at the theater or a long day at the office. Price range: Wine is sold in flights (four 2-ounce tastings for $12), by the glass ($6 to $10) and by the bottle (from $24 for the Avia Pinot Grigio to $75 for the G.H. Mumm Cordon Rouge Brut Champagne). Happy hour from 3 to 7 p.m. features half-off or $2-off specials. For non-wine drinkers, bottled beers range from $3 to $5. Food is hors d’oeuvre style and features small plates, including a $3 cookie sampler, $8 “breads and spreads,” $10 crab fondue and $13.50 European cheese platter. How to pay: Cash or credit cards. Parking: Along Main Street or side streets.